Whispers in the Loggia: On Immaculate Conception, the Madonna as "Victory of Mercy"
On Immaculate Conception, the Madonna as "Victory of Mercy"
And so, a busy Jubilee Year began with just the first of many packed days to come. 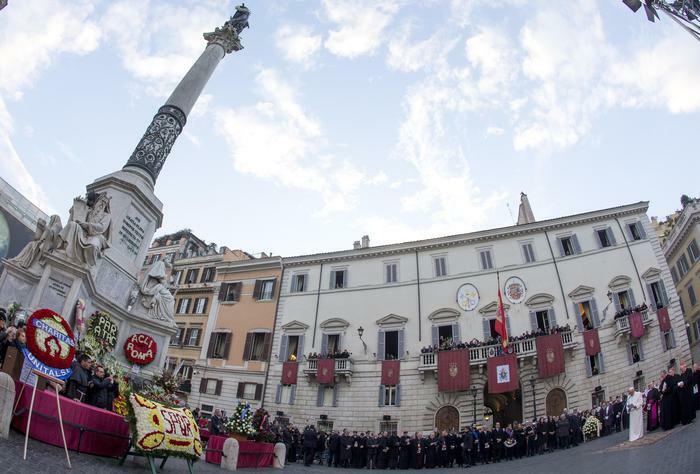 With the wake of last month's Paris attacks (coupled with an ongoing ISIS threat on the Vatican) having spurred a remarkably heavy security operation in Rome for the Holy Year – Italian reports indicated a team of some 3,000 military and police on hand for this morning's opening rites – Francis kept to his preference of working the crowd at length following the brief Marian ritual, walking the length of the square to greet the elderly who lined the throng's front flank in wheelchairs. On behalf of God’s holy people who live in this city and diocese. Who have come from far-away lands in search of peace and work. Because you are the Mother of Mercy. Saviour of every man and every woman. Free from slavery, rancor and fear. The Father awaits you with open arms. He will forgive and welcome you into his house. You are near us and help us through every difficulty. May God bless you, now and forever. Amen. With the St Peter's Holy Door now open – and as many as 30 million pilgrims projected to pass through it over the next 11 months – on Sunday morning (the day set for the Jubilee's opening in the dioceses of the world), the Pope will push through the portal of Rome's cathedral, St John Lateran, following suit at St Mary Major on the New Year's Day feast of Mary, Mother of God. At St Paul's Outside the Walls, however – where St John Paul II opened the Holy Door in 2000 during an ecumenical prayer service – the honors won't be done by the pontiff, but the basilica's Wisconsin-born archpriest, Cardinal James Harvey, at a Sunday rite.